July is National Ice Cream Month and Sunday, July 16 is National Ice Cream Day – so we’re serving up the scoop on the best ice cream shops in Wichita. Americans have been observing these national celebrations since 1984, when President Ronald Regan made the ice cream proclamation. It appears we don’t need encouragement to indulge in this cool treat, though: the average American consumes almost 22 pounds of ice cream each year, according to the International Dairy Foods Association. A restaurant devoted entirely to dessert? You bet they have ice cream on the menu! 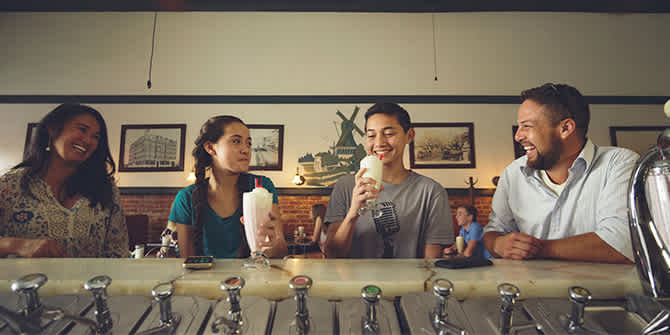 Milkfloat, in the Historic Delano District, makes their own ice cream – rich chocolate and vanilla bean – and serves it in cups, cones rolled in a topping, shakes and malts with mix-ins or in soda floats featuring hand-mixed flavors: birch beer, blood orange, vanilla cream and chocolate egg cream. Their cakes, pies, puddings, brownies, cookies and pop tarts are made from scratch and the menu changes every two months. Visit Churn & Burn in east Wichita and order a dessert of the same name. They freeze your ice cream and coffee within two minutes using liquid nitrogen to create a smooth and perfectly textured ice cream treat. You can also order your ice cream without coffee and your coffee without ice cream here! Create your own custom flavor and watch it made in front of you, or choose from one of the flavors in their case. As a bonus, the place is decorated with relics from the memorable Joyland Amusement Park. Another fun experience is watching your ice cream being rolled at the new 8° Below Rolled Ice Cream kiosk outside Union Station in downtown Wichita. Pick your flavor – vanilla, strawberry, coffee or green tea – and watch it be flattened on an 8-degree-below-zero pan, then scraped into rolls that are arranged in a bowl. Choose a signature combination or create your own with a choice of mix-ins and toppings, as well as drizzles. One of Kansas’ most complete soda fountains is still in use at downtown’s Old Mill Tasty Shop. Stop in to see the set-up built in the late 1920s: it has the back bar, mirror, brass rail and a marble counter that seats nine. Take a seat at the 25-foot marble counter, visit with the soda jerks, then watch them make your banana split, malt or float the old-fashioned way. Located in Clifton Square in the heart of the Douglas Design District, the College Hill Creamery serves hand-dipped ice cream, gourmet coffee and tasty combinations of both. You’ll find traditional flavors plus plenty of designer flavors. As if the massive scoops on a fresh waffle cone aren’t enough, a malt ball is in the bottom of each cone.